The trend in medicine is to explore nonsurgical solutions to various health problems. 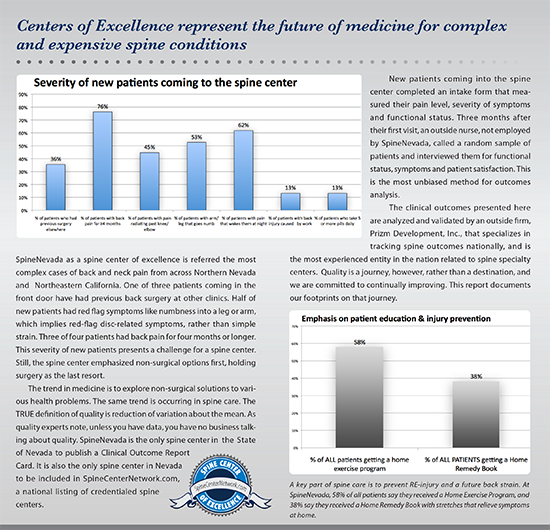 The same trend is occurring in the area of spine care. 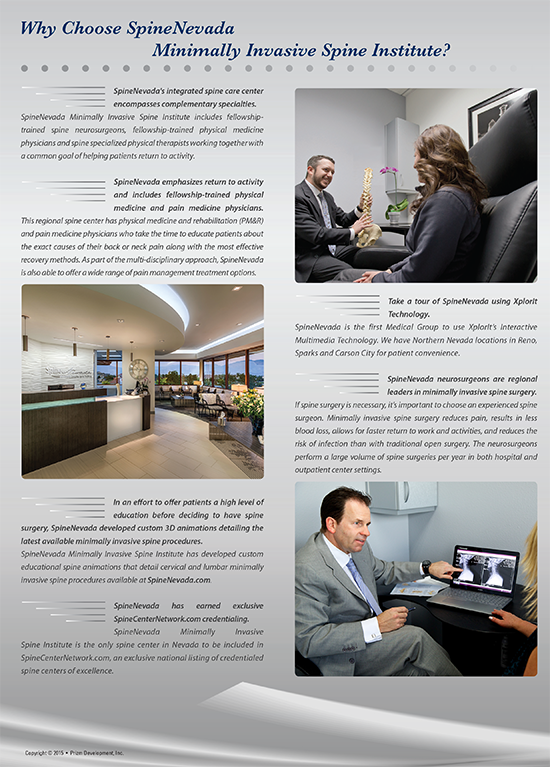 SpineNevada uses written protocols that emphasize a nonsurgical approach first, and surgery is held as the last resort. The TRUE definition of quality is reduction of variation about the mean. As quality experts note, unless you have data, you simply have no business talking about quality. New patients coming into SpineNevada completed a clinical outcome tool that measured their pain level, severity of symptoms and functional status. Three months after their first visit, an outside nurse unaffiliated with SpineNevada called a random sample of these patients and interviewed them for functional status, current symptoms and patient satisfaction. This is the most unbiased, statistically relevant method for outcomes analysis. 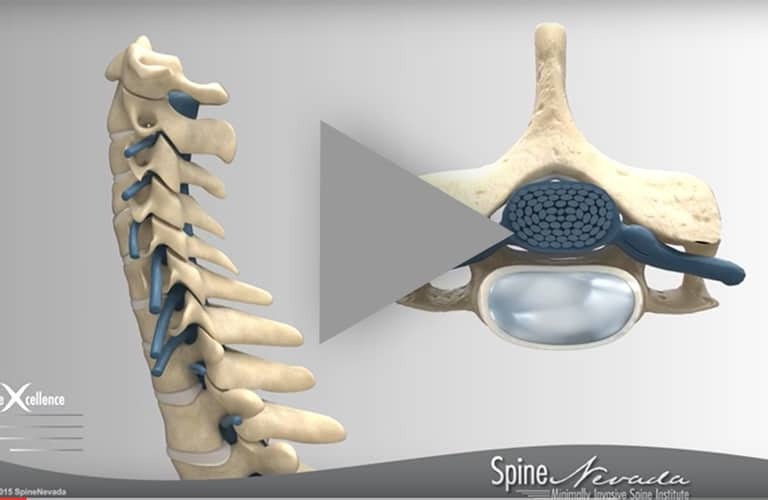 The clinical outcomes presented here are analyzed by an outside firm that specializes in tracking spine outcomes, and is involved with other spine centers across the U.S. The results show that SpineNevada receives at its front door the most complex patient base in the region. Over one in three new patients to SpineNevada had previous back surgery, and 76% had suffered from back or neck pain for more than four months. Additionally, 45% of new patients had serious neurological symptoms like pain radiating beyond a knee or elbow, which can imply a serious disc-related problem. But even with the most complex patient base, the center had impressive outcomes. As to patient satisfaction, 91% of the patients studied in this sample said they would recommend SpineNevada to a friend. Quality is a journey, however, rather than a destination, and we are committed to continually improving. This report documents our footprints on that journey. At intake, 53% of patients rated their pain level at 7 or more on a 1-10 analog pain scale. After three months, it improved to only 29%. The main reason people go to the doctor is for relief of pain. But if a spine clinic focuses exclusively on pain, it can miss the target of return to function. A spine specialized physical therapist provides pain relief and then moves the patient quickly into supervised exercise. This chart shows that SpineNevada has good success relieving pain, eliminating numbness and radiating pain in legs or arms, and ultimately returning the back pain sufferer to activity — after only 3 months of care. Self-reported pain levels decreased, as did patient-reported limitations related to carrying groceries, climbing stairs and standing for a half hour. Having a more complex patient mix makes return to work more difficult than an occupational medicine clinic, or primary care clinic that treats simple onsets of acute back pain that can go away on their own. Of SpineNevada’s new patients, 76% had back or neck pain for more than 4 months, and 45% had radicular pain below a knee or elbow. Another 53% had numbness in a foot or arm. 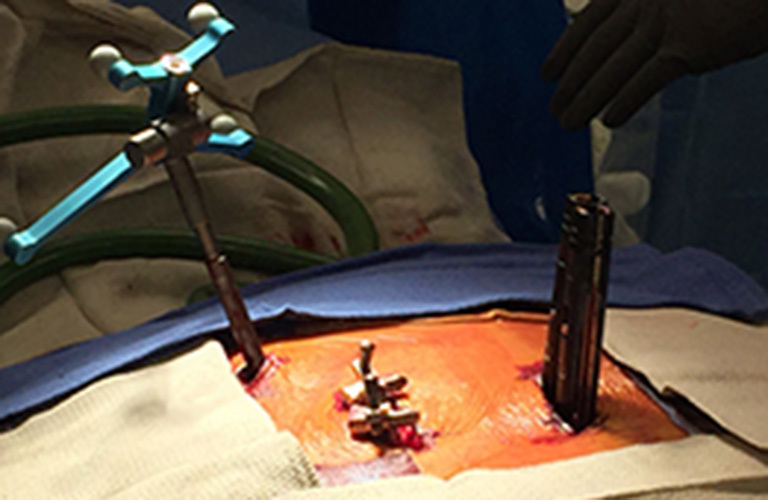 One in three new patients to SpineNevada had previous back or neck surgery, implying either failed back syndrome or degenerative disc disease — a highly complex patient base. Encouraging patients to get moving and return to activity is key. 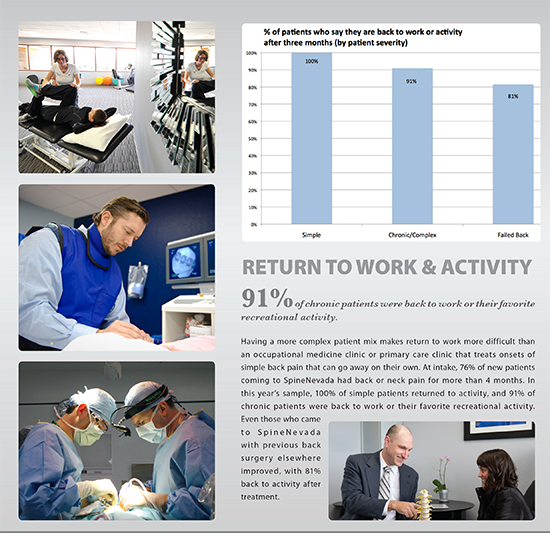 For example, even with a complex patient mix, 91% of chronic patients were back to work within 3 months after visiting SpineNevada. 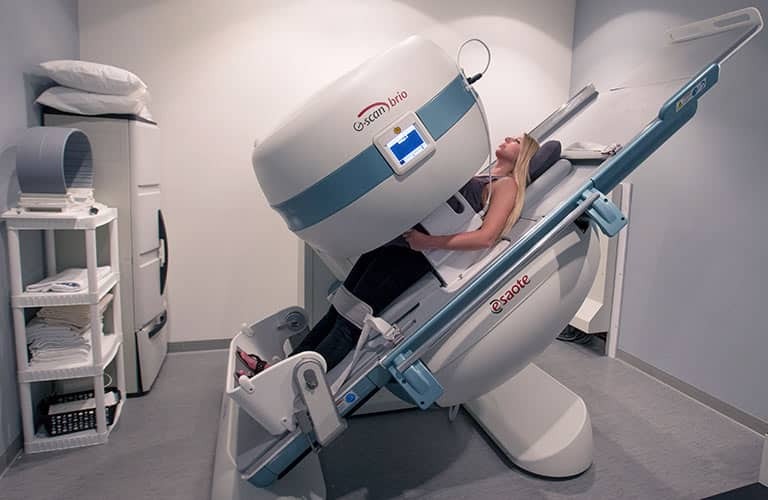 SpineNevada emphasizes nonsurgical treatment options like spine therapy, exercises and spinal injections that can relieve symptoms without the need for surgery. Consequently, even though 36% of new patients were “previous back surgeries” from other clinics, and 45% of new patients had pain radiating below a knee or elbow (implying a disc problem), only 20% of patients needed surgery — a much lower surgical rate than at other clinics with similar patient severity. 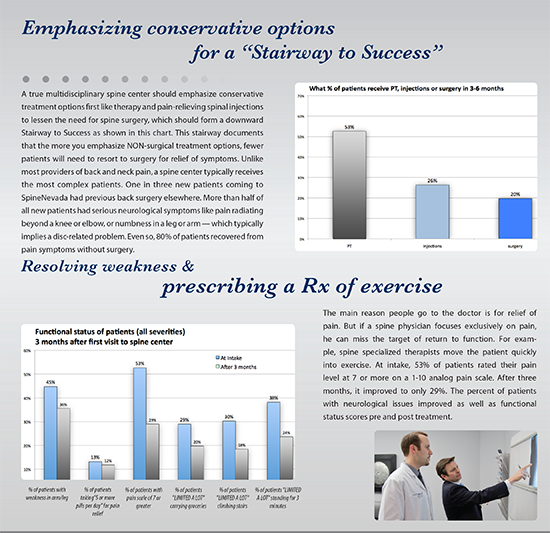 A true spine center should see a “stairway to success” in this histogram, showing that the more nonsurgical options are tried first (PT, injections), the fewer patients need surgery.